Craigievar Castle near Alford, Aberdeenshire has been refurbished after its former pink exterior turned a less attractive orange. 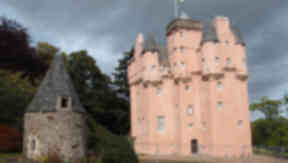 The Scottish castle that inspired legendary cartoonist Walt Disney has been restored to its original pink. Craigievar, in Aberdeenshire, had been obscured by scaffolding for two years after its 30-year-old cement harl had made it look orange. Castle owner, The National Trust for Scotland, has now returned the 17th-century A-listed structure to its former fairytale hue by replacing the harling with a traditional lime mortar tinted by natural earth pigments. Project manager Ian Davidson said: “It would be fair to say that visitors to the castle will notice a change. “While the previous harl gave the building a reddish-orange appearance, the new lime coat means the castle is now noticeably pinker than before. We believe this is a close copy of the colour used on the castle in the past. Walt Disney is believed to have based his design for his own famous fairytale castles on Craigievar – six miles south of Alford - after seeing pictures of it. Echoes of the design can be seen at Disneylands around the world, including EuroDisney outside Paris. Scaffolding that had hidden the castle during its £500,000 facelift was finally removed at the weekend. Daphne Rose, property manager at Craigievar, said: “It’s been a privilege to have been here throughout the re-harling project- I’ve found it a fascinating and rewarding experience. The painstaking process of removing the former harl had to be done by hand with hammer and chisel as the use of vibrating machines could have damaged the delicate interior. Archaeologists, meanwhile, used the scaffolding to undertake a detailed survey of the property. Their work confirmed the intriguing fact – that Craigievar (built in the 17th Century) was constructed over the top of a 16th Century castle. Originally built by the Catholic Mortimer family, Craigievar took on its modern shape when it was bought by staunch Calvinist William Forbes in 1610. Forbes carried out radical changes to the building, demolishing the castle chapel and building an extra story covered in water spouts, decorative cannons and sculpted heads. The main contractor for the project was Laing Traditional Masonry, based at Castle Fraser, whose work was managed on site by Stephen Harper. The castle will reopen to the public next spring.